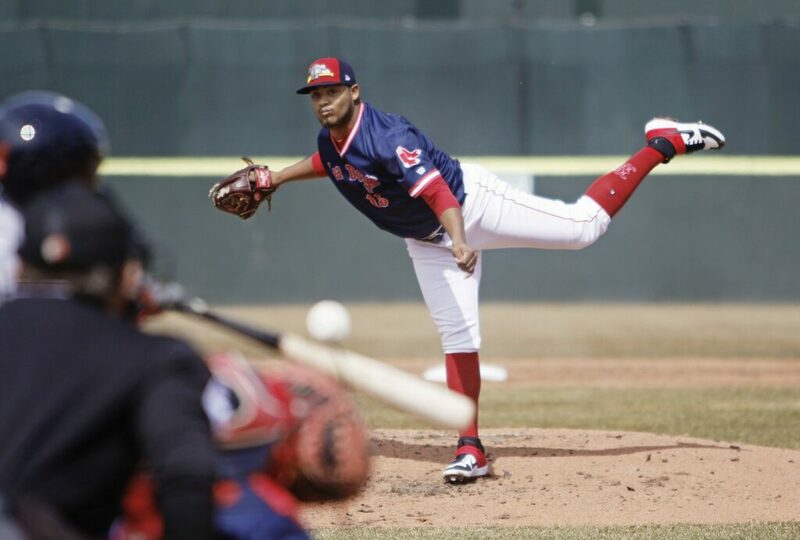 The top Red Sox pitching prospect allows two hits in five innings as Portland tops Reading 6-0 for its first victory of the season after three losses. The Portland Sea Dogs’ 0-3 start through Saturday brought comparisons to the struggles of their parent club. Is this where we remind the Dogs’ faithful that the minors is all about development? 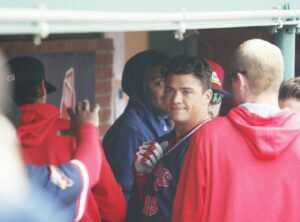 On Sunday, that development came through, with left-handed prospect Darwinzon Hernandez striking out 10, while Bobby Dalbec homered. But wins are nice, too. Hernandez’s start, along with homers by Dalbec and Jantzen Witte put Portland in the win column for the first time this season, with a 6-0 victory over the Reading Fightin Phils at Hadlock Field. Hernandez dominated for five innings – allowing two hits and four walks, along with the 10 Ks. His fastball ranged from 93 to 96, and his curve, slider and change-up produced swings and misses – nine of his strikeouts were on swings. He exited after 74 pitches (44 strikes). Hernandez, 22, is Boston’s top pitching prospect (and fourth overall) according to mlb.com. Hernandez was invited to major league spring training camp for the first time. For a while it looked like he might make the big-league club. Boston, which could use a hard-throwing left-hander in the bullpen, didn’t send Hernandez to the minors until March 23. In spring training, Hernandez pitched six games (11 innings), and recorded a 0.82 ERA and 12 strikeouts – but also eight walks. Hernandez is working on his command. He seemed polished in the first inning, striking out the side on 10 pitches (nine strikes). But command sometimes slipped. His four walks all came on four straight balls (twice with 0-1 counts). Manager Joe Oliver agreed. He managed Hernandez last year in advanced Class A Salem. Hernandez, speaking through an interpreter, kept deflecting questions about his outing and praised the pitch-calling of catcher Jhon Nunez. Portland pounded 14 hits, including 3-for-4/two-RBI days from Dalbec and Witte. Dalbec, Boston’s No. 3 prospect, homered on a hanging slider (107 mph off the bat, estimated distance of 388 feet). He also beat Reading’s shift twice, with ground balls to right center, one for an RBI. Andrew Schwaab (four strikeouts) pitched two innings of one-hit relief. Durbin Feltman (one strikeout) and Matthew Gorst (two) both enjoyed 1-2-3 innings. NOTES: The announced paid attendance was 6,242 … The 17 strikeouts by Portland pitchers was the most since the the 17 strikeouts six years ago against Trenton. … Shortstop C.J. Chatham stroked his third double of the season and is now batting .333. … The Binghamton Rumble Ponies come into town for a three-game series starting at 6 p.m. Monday. Gone from the Ponies is outfielder Tim Tebow, the former Heisman Trophy winner now playing in Triple-A.